Dreaming of festival season's arid heat and free-spirited frocks. 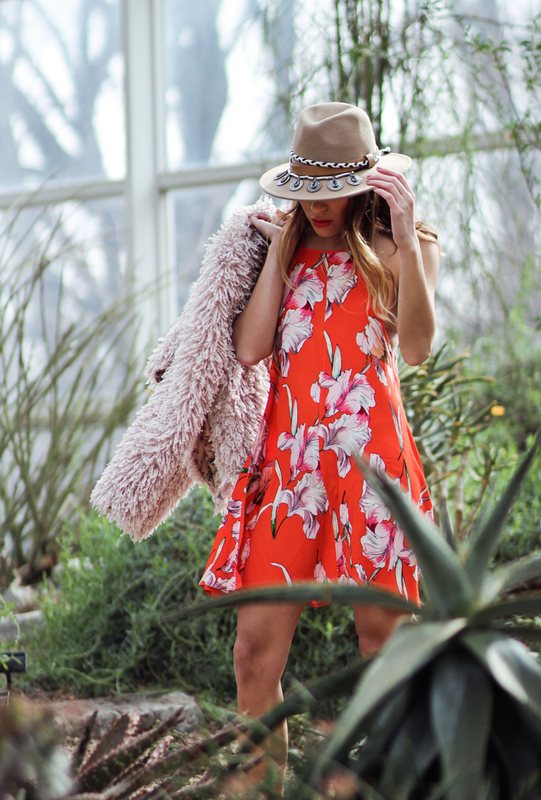 'Tangerine Dreams' swing dress c/o Minkpink, Free People shag jacket (similar here), Zara coin hat. Shot by Isaac Lacey at the Brooklyn Botanic Garden. It's the weekend: let's go explore. Escape from the snow and cold, if only for a brief moment in time. Our feet might still be planted in Brooklyn, but our imaginations are soaring elsewhere, returning to all the coastlines and covetable destinations we've visited and dreaming of all the beautiful places the future has yet to reveal. It's all too easy to transport ourselves to another place together. Thank you for being my partner in crime, love and endless adventure. WOW this dress is stunning! I think I need this in my life! Holy toledo I need that dress! I love the look of the red pop lips with the red pop dress. Looks amazing against the dull green leaves of the background. Also, the ombre hair is on point. You look amazing, Such a pretty dress! Such a pretty dress. Great blog you have, stay inspired! That dress is so so beautiful! Love the hat too! this dress is so pretty! love that shade of orange on you!